Walnut oil is one of the few natural sources of omega-3 fatty acids, whose effect is very important for the human body. The health benefits of this product are different, and are mostly related to the skin, hair and cardio-vascular system. Its medicinal properties were first detailed in the thirties of the twentieth century, after which the walnut oil became popular around the world. Walnuts are delicious and very healthy, and we love them raw. They provide the necessary dose of medicinal substances that protect and strengthen our body, especially they have a positive effect on us which you will surely admire. Further in the text find out how useful and good walnut oil for hair, face, and health as a whole is, and in what other ways you can use it. Why walnut oil is so good and useful? It has long been known that walnuts are healthy and useful source of nutrients needed by our body for a better and more regular work. In the world there are over 30 species of trees and each has different characteristics. The largest producers of nuts in the world are the US, China, India, France and Chile. However, a special focus is placed on the walnut oil, which has its beneficial effects thanks to omega-3 fatty acids. Because of this, the composition is considered a natural wonder, because it successfully helps the body to regulate blood cholesterol levels, eliminates high pressure, helps with weight loss, but also to alleviate winter depression. Walnut oil has proven to be an excellent remedy for winter fatigue because it contains valuable omega-3 fats, which are very much present in the fruits of nuts. Walnut is a remarkable fruit, especially for the needs of our body during the winter. It is a delicious natural food supplement, rich in minerals and good fats, but is excellent as a snack, in salads, with cheese, in various sauces and other. How many calories does oil from the nuts contain? One tablespoon of walnut oil contains 124 calories and 14 grams of fat. However, it is vital that this preparation is included in your daily eating habits, because it will give your body the required dose of unsaturated acids. Thanks to the above, walnut oil as a medicine will help you to get rid of the risk of inflammation, and therefore will strengthen the immune system in a natural way. This composition can be used as a cooking additive or as a cosmetic product. Japanese and French cuisine has long used it in the preparation of cold foods, especially concerning both fish dishes and salads. Many Asian nations used walnut oil for the face, as a pomade for centuries, because they recognized its beneficial effects on the skin. In addition, it proved more than useful than when it came to hair care because it strengthens the hair and prevents its decline. If you are interested in how to make oil from nuts, we will share with you a simple recipe, which you can easily prepare yourself at your home. You need to get a couple of green (unripe) walnuts and cut them into 8 equal parts. After that, put them in a glass jar of adequate size and pour with olive oil, so that these pieces are completely covered. Close the lid from the top and shake well, then set aside in a warm place where they will stand for 45 days. It is best for it to be outside, where they will be exposed to sunlight. During this period it is necessary from time to time to shake the jar. After all that, take a cheesecloth and strain the obtained walnut oil in a glass bottle. Thus prepared product store in the dark and cool place, after which it can be used to meet your needs. In addition to hair care and face, this recipe has proven to be an excellent remedy for winter fatigue, because it is rich in precious omega 3 fats. We recommend that you always prepare yourself walnut oil, because factory-made are usually treated with various chemicals, and are not nearly as effective and good, as a domestic product. 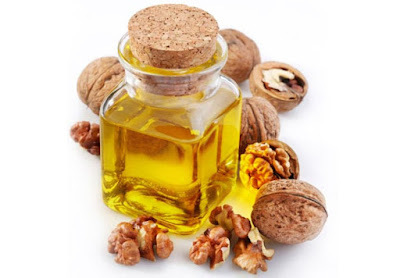 What are the health benefits of walnut oil? As for the healing properties of walnut oil, they are numerous, and we will share most important ones. Walnut oil is rich in monounsaturated oils, such as omega-9 that helps the arteries and veins to retain its elasticity. Consequently, it improves blood supply thus avoiding the risks of heart disease, such as high pressure or heart attack. In addition to being good for the blood vessels, walnut oil for the heart is a true soothing and healing spring acids that are very useful in prevention of a number of diseases of the cardiovascular system. Primarily it comes to an alpha-linolenic acid, which is a type of omega-3 fatty acids, but it is known that it is essential for the health of the heart and arteries. This remedy is rich in omega-6 fatty acids, and is a real natural remedy for inflammation. The oil of nuts can be used whenever you have problems related to inflammation, but it is especially important to use it to prevent the onset of arthritis. Phytonutrients which walnuts are rich in are an excellent source of selenium, phosphorus, magnesium, zinc, iron and calcium. They are very important for the regulation of hormones in the human body, so we therefore recommend walnut oil for thyroid that gives great results. Another healing property of this product is that it contains a complex of vitamins B1, B2 and B3, which in combination with vitamin E is an ideal combination for your skin because it allows it to be soft, smooth and shiny. It is particularly useful to use walnut oil for the face if you want to alleviate and eliminate pimples, acne and blackheads. Only a few teaspoonful of this mixture per day can be useful to those who have problems with the appearance of eczema and various kinds of rashes. In addition, if you want to remove the irritation caused by the bite of an insect, it is enough to rub a few drops of walnut oil on the problematic place and in a short time all the symptoms will disappear. Since it is rich in antioxidants, walnut oil for the skin represents a kind of anti-aging product. Thanks to the capacity to quickly eliminate all free radicals that cause cell damage, it significantly slows the aging process of the skin and contributes it to be elastic and shiny. This product is recommended only for those who have darker hair. In addition it gives the hair slightly reddish glow, which can be a very nice visual effect. Thanks to the aforementioned omega-3 fats, it successfully strengthens hair roots, eliminates dandruff and excess oil from the scalp. If you regularly use the walnut oil on your hair, it will be great, soft, and luxuriant and will not be prone to cracking or even declining. We will share with you a useful recipe for a mask that will help you if you have a weak, thin and oily hair prone to cracking. In a bowl, mix all the ingredients. When a uniform and slightly foamy mass forms, lubricate hair with gentle movements onto the scalp. Wrap a plastic bag or foil around your head and put a towel over it that you have previously warmed up. Let it stand for about an hour on the head in order for walnut oil to take effect. Afterwards, rinse it with warm water and apply a natural conditioner. Walnut oil can be applied directly to the skin, whether it comes to the face, legs, arms, stomach and legs. Regular use in small quantities will give fantastic results of which you will be delighted. As already mentioned, walnut oil for the skin represents a unique anti-aging product. To eliminate wrinkles around the eyes, or those at the forefront of the next mouth, it is sufficient that every day before going to sleep massage the skin with a few drops. Already after two weeks you will notice a significant improvement, and the skin in these areas will be more elastic and visibly rejuvenated. Since it contains unsaturated fatty acids, you can use walnut oil on your face, if it is dry. Unlike other cosmetic products and lotions, it is not greasy and dries quickly and absorbs quickly. The skin will be hydrated, but the best results except for the face are achieved even in areas of the knees and elbows that are most vulnerable to dry and cracked skin. Except for darkening hair, walnut oil has the same effect on our skin. Especially when it comes to the sun, it gives the effect of darker complexion in a completely natural way, so you are advised to be sure to try this product. In addition, walnut oil for tanning will protect you from the harmful effects of UV radiation, and your skin will be safe, beautiful and you can get a nice bronze colour if you always wanted and natural tan. Walnut oil has antifungal properties, and can therefore be used in those who have problems with athlete's foot, as well as in alleviating the symptoms caused by Candida. Daily topical application of this product, you will achieve the desired results. However, with these problems you need to be patient and to wait at least four weeks to notice signs of improvement. Homemade nut oil can be used in massage. Specifically, it has been shown that walnut oil has anti-inflammatory effect, and successfully eliminates the pain. It is especially effective in treating problems with varicose veins, by rubbing oil in gentle movements and you will feel immediate relief and cessation of pain. What is the price of walnut oil in stores? This product is available in all health food stores and in some supermarkets, which have a booth with natural substances. Usually walnut oil is sold in bottles of 30 ml, which cost about 3 dollars, while for the larger packs of 250 ml you should set aside just over 9 dollars. In addition, it can be ordered through specialized online stores, where the price is more favourable. Walnut oil has a limited shelf life, and it is a period of 6-12 months and always check what the label of the preparation states. In order to retain all the healing properties, be sure to store it in a cool, dark place. Refrigerator is best, because in this way it prevents rancidness of this product. It is very important that you do not use walnut oil in the preparation of fried and cooked meals, because then it loses all these beneficial qualities, so therefore use it primarily as an addition to salads and cold sauces. This outstanding product is particularly useful during winter, when it is advisable to eat raw fruits to strengthen immunity. However, you must know that fresh walnuts and homemade walnut oil are not the same, namely fruits are very caloric and contain a lot of fat, so consume them in small amounts.